My parents flew out for a visit over the last couple of weeks. It was their first visit with Phinehas and my dad’s first tour of our little Georgia homestead! Actually, we spent most of the visit in Blue Ridge,Georgia, relaxing in a beautiful mountain loge. Of course to a family with roots in Oregon, the lodge was more accurately located in the hills, but it was beautiful and relaxing all the same. When we finally did come down from our little retreat to spend a few days at home, Dad asked if I had any projects I would like help with. “As a matter of fact I do!” I said while giving Dani a triumphant look. She had laughed at me the week before when I had suggested that Dad could help me with the Rabbit hutch repairs I had on my “To Do” list. She figured he wouldn’t want to spend the few days he had here employed on one of my dirty back yard jobs. Ha! I love my dad. Our rabbit hutches are literal mansions. 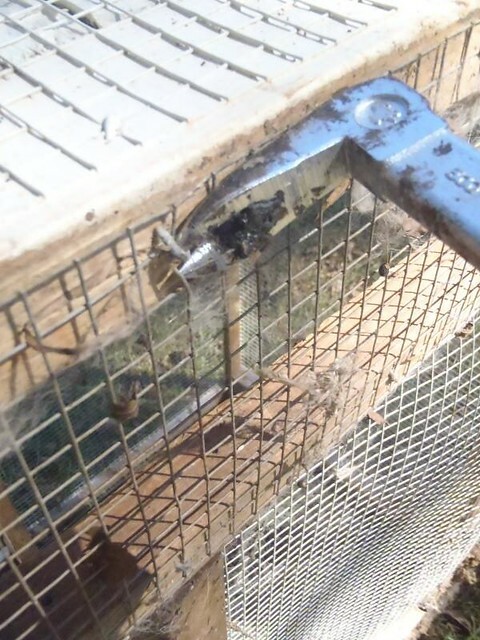 They started out as rabbit tractors with a six inch wired barrier around the perimeter to prevent our little furry livestock from digging out. Having seen the “Shawshank Redemption” though, we knew to check behind posters and the like for holes in progress. What we found out, is that although the spirit behind a rabbit tractor is well intentioned, six inch barriers only keep them from digging out. Rabbits are natural diggers, and they will dig for fun and too keep cool too, which is exactly what happened all over our yard. We realized after one season that tractors were not going to be a sustainable prospect if the intention was to keep growing grass, so I made some quick improvements to the floors of the hutches and stretched contractor’s fabric over them so I could raise them off the ground. We still love the size of the exercise yards (if we can call them that). What was meant to be ample space for grazing still contributes to a quality of life most captive rabbits don’t get to enjoy. 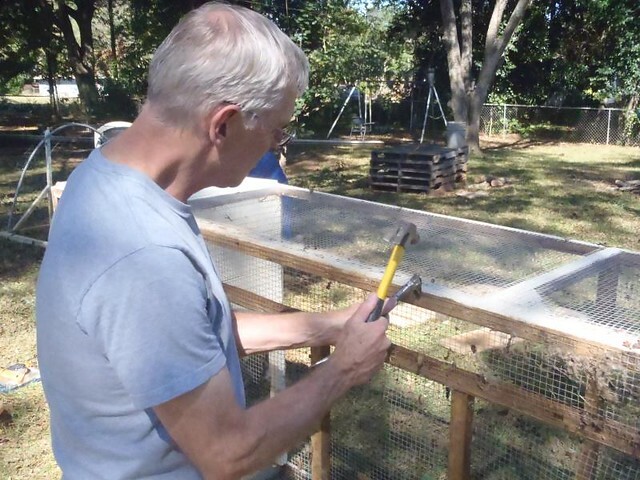 Our large hutches have also allowed us to successfully experiment with raising rabbits in colonies. The new solution was easier on the grass, but not hassle free. We quickly discovered that the spaces between the wires were too small for the adult rabbit poop, so we had to regularly clean everything out. Then, the thin gauge and brittle welds of the contractor’s fabric started to break down. It was only a matter of time before the woods around our house would have been teaming with rabbits with domestic colorations in their coats; kind of like Buck’s offspring in “The Call of the Wiled”. There were really three lessons we learned the hard way. One, don’t use contractor’s fabric for the floor of your rabbit hutches. Two, make sure there is enough support for the wire. The weight of a colony of rabbits can be quite stressing on large, unsupported sections. In our case, the wire was stretched over 2 feet by 3 foot open spaces. That’s a good way to make a hammock, but not so good for the longevity of the wire. Three, don’t use permanent plywood floors in your nesting boxes. They are hard to clean, and well; they really never get all that clean. 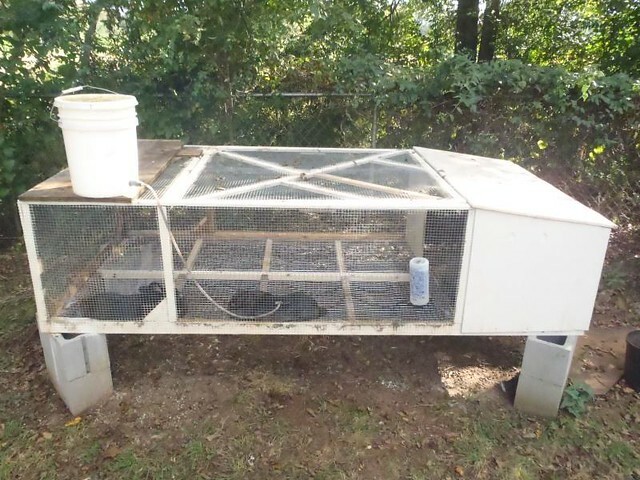 Two things I am very happy with were the fact that I used poultry net staples to attach the wire the wooden hutch frame, which are very easy to remove. And I build everything on our homestead with brass woodscrews, which are easy to back out for just such occasions as this! I was able to salvage everything from my original floor structure so I only needed 3 new 8 foot sticks of 1 x 1 pine to build this updated design. The spaces between supports are now only 1.5 feet by 20 inches. 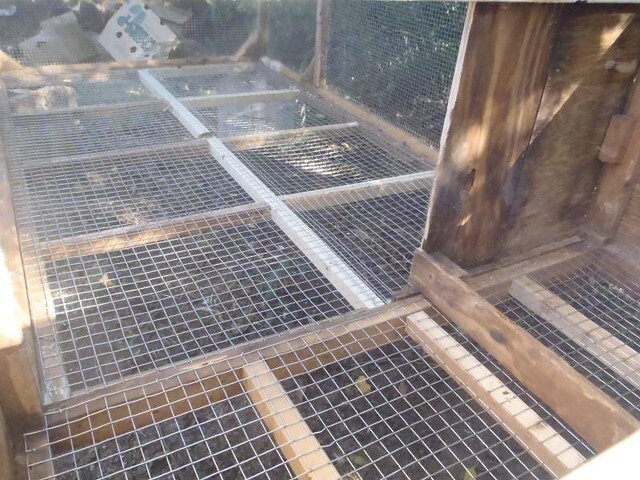 Here is a shot with the new galvanized cage wire floor taken from inside the nesting box looking out. 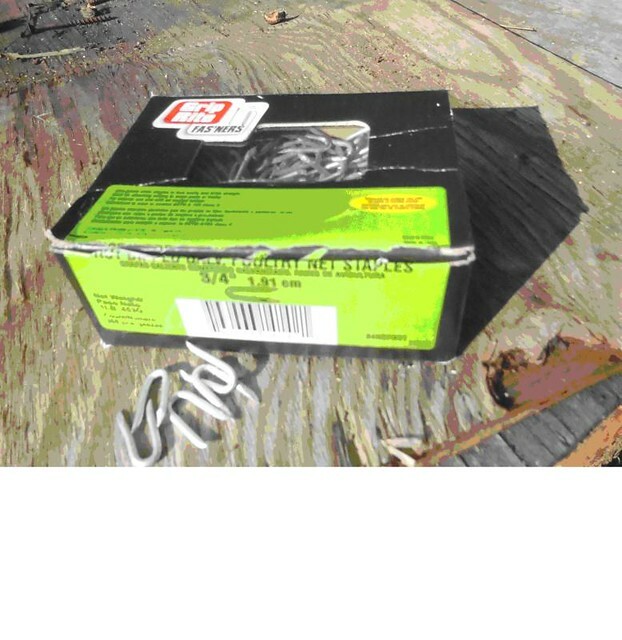 The next time we are expecting a litter I plan to lay a small piece of plywood inside the right side of the box where you can see the little barrier. It will come back out as soon as the bunnies are large enough to leave the nest. I had to stretch two lengths of the wire lengthwise to cover the exercise area. The nesting box was a third, shorter piece stretched horizontally from this perspective. 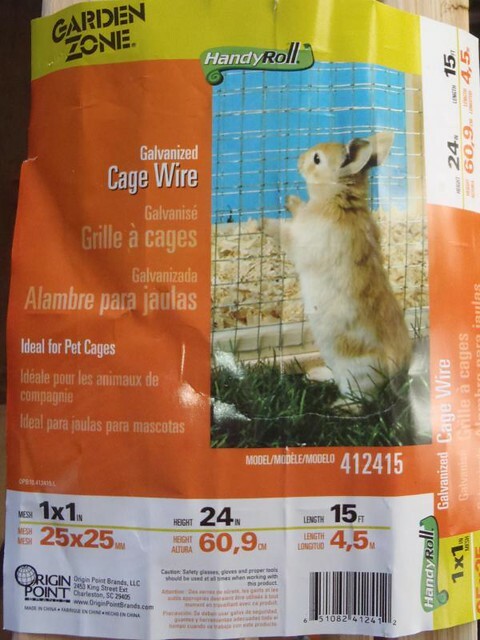 Below is the product wrapper for the cage wire I used. Can anyone tell me why the picture may not be the best choice of advertisement? * I did not actually have to buy more screws. One box lasts several projects. The same goes for the nails. Hi. So to clarify, your tractors were open on the bottom? I put fencing on the bottom of my tractors, where they cant dig, but can get to the grass… The holes in the fencing are about 2 x 3 “. So sorry just saw this. Yes our tractors were open on the bottom originally and were used for grazing. We tried a larger wire like that too but ultimately they still dug consistently and we couldn’t manage the holes as we were at a rental. If you had them on a pasture or could move them very frequently (1-2 times a day) or had less rabbits to a pen we could see it working. For our time and needs at the time we couldn’t manage it so we ultimately raised them off the ground and brought them garden scraps. I am so impressed with anyone who can build their own ANYTHING! 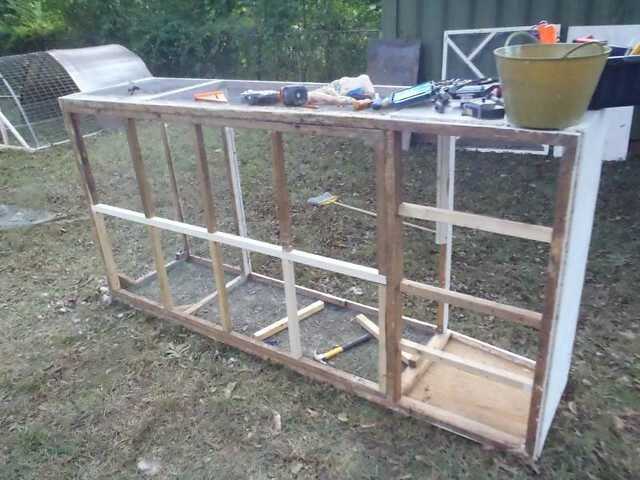 I attempted to build a rabbit hutch but gave up pretty quick. So far we’ve been happy with the rabbit hutch we bought online but maybe someday I will attempt to build one again. 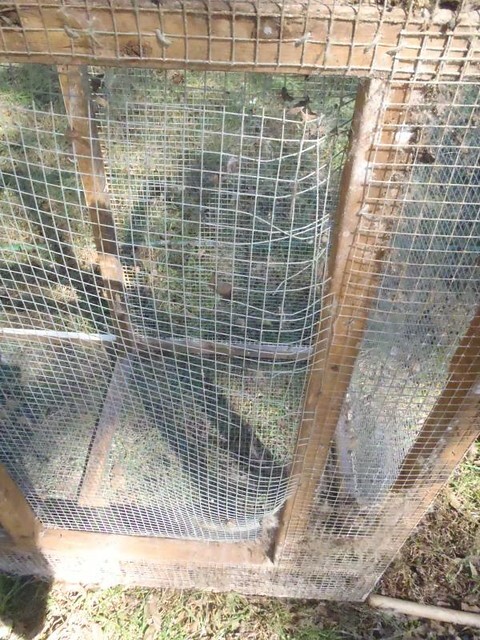 My brother used to have a rabbit cage similar to yours. They were fun to watch and play with. I don’t remember whatever happened to his rabbits. We love watching them run around and play. Such a nicer life than one bunny in a tiny cage all by themselves. Our son raised rabbits and we did rabbit tractors too. Ours were flat on the ground which was great just had to make sure they were on higher ground if rain was coming. Here’s a thought – you could add wheels so moving the set up would be easier. Ground would still get fertilized and if you place in a tall grass area the bunnies receive some awesome natural health benefits. It nice that you’re family was there to help. That’s an interesting ideal Carole! If we ever have pasture vs a backyard I think that would make a great solution, we keep the yard too short I think for animals to try to keep the ticks down in the summer. This rebuild should last through many rabbit litters indeed! 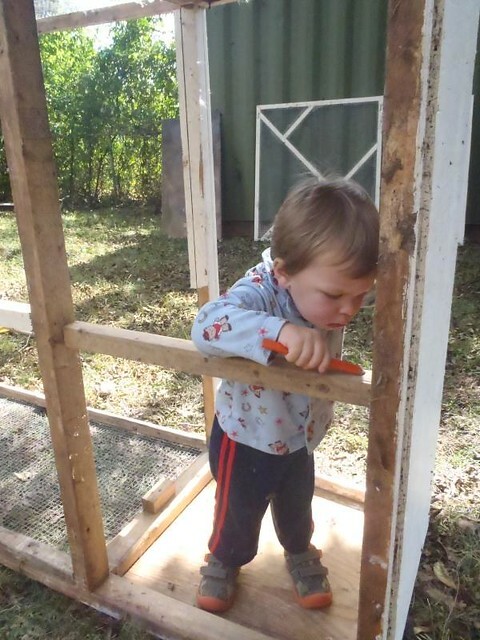 Love the three generation project…even the pj's lol! Yes it will make it so much nicer to maintain! They did a great job!